DPA microphones, including the new 4099 instrument mics, have been used for Rick Wakeman's The Six Wives of Henry VIII performances at Hampton Court Palace. Wakeman's solo debut album was released in 1973 but he was refused permission to perform it at Henry VIII's 16th-century palace. More than three decades later, Wakeman finally realised his dream when he was asked to appear to commemorate the 500th anniversary of Henry VIII's accession to the throne of England. Never before performed in its entirety, Wakeman's two live performances of the album were played out against the backdrop of the West Gate of Hampton Court Palace. In front of the building stood a large stage supporting 30 members of the English Chamber Choir, the 50-piece Orchestra Europa, a rock band and Wakeman himself. Thirty DPA 4061 miniatures provided by Wigwam Acoustics were mounted onto the bridges of all the strings - violins, violas, cellos and double bass. "It's a no brainer why I chose them: they are the best sounding string bug and are accepted by most musicians as they realise they in no way damage the instrument," says front of house engineer Ian Barfoot, who specified the mics. "They have become the standard for TV and amplified concert performances where you need lots of level and total control. Most musicians are more than happy to fit them to their instrument, which is a bonus. They are also very discreet for TV purposes, and as the show was being recorded in HD for DVD release, I'm sure the use of such small microphones cheered up the video director." Barfoot also solved the problem of miking the harp by using two of DPA's 4099 violin instrument mics. "Fitting the 4099s to the harp was a totally obvious choice," continues Barfoot. "It's difficult to get a good mounting position on the harp as the playing position versus the rest position means the sound changes. 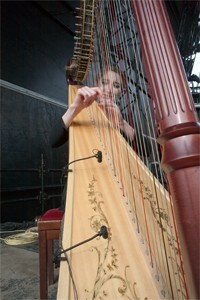 However if the microphones are clipped to the harp itself, the position remains constant, as does the sound. The design of the clip means yet again there can be very little chance of damage to a valuable instrument which can cost up to £50,000. The 4099 is quite small so relatively discreet, and as they don't require a stand there's more room on stage. The gooseneck design give lots of scope for positioning, though fortunately this harp had an extended soundboard which made fitting the 4099s very easy. The cardioid response means you can isolate the harp a little more from other instruments. "The harpist was very interested in the whole idea, and didn't mind me trying a few different positions for the 4099s on the soundboard to get the sound I needed. This particular harp was a very warm sounding instrument which also had a bright, high register. Both qualities were readily discernable in the amplified sound. Other than a little careful filtering, no EQ was applied to the harp mics and they sat very nicely in the mix with the rest of the orchestra."